Mojito flavor gives you the taste of sweetness, citrus and mint flavors combination in a cocktail. It is complimenting the rum and also becoming popular in drinks most especially summertime cocktails. 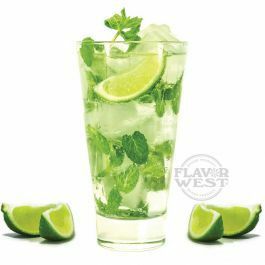 Type: Mojito Water Soluble Flavoring. Ingredients: Natural and Artificial Flavoring, Propylene Glycol. USP Kosher Grade Flavoring. Usage Rate: 15-20% for E-use. Flavor suitability: Suitable for shakes, smoothies and cocktails. Specific Gravity: 1.09 No Refunds on Flavoring.